I started my centenary commemoration project in 2014 in Sarajevo where 100 years earlier Gavrillo Princip’s assassination of Archduke Franz Ferdinand set off a chain reaction that resulted in the deaths of more than 20 million people from 32 countries. I followed the shock waves down to Gallipoli in 2015, the Somme in 2016, and Passchendaele in 2017. 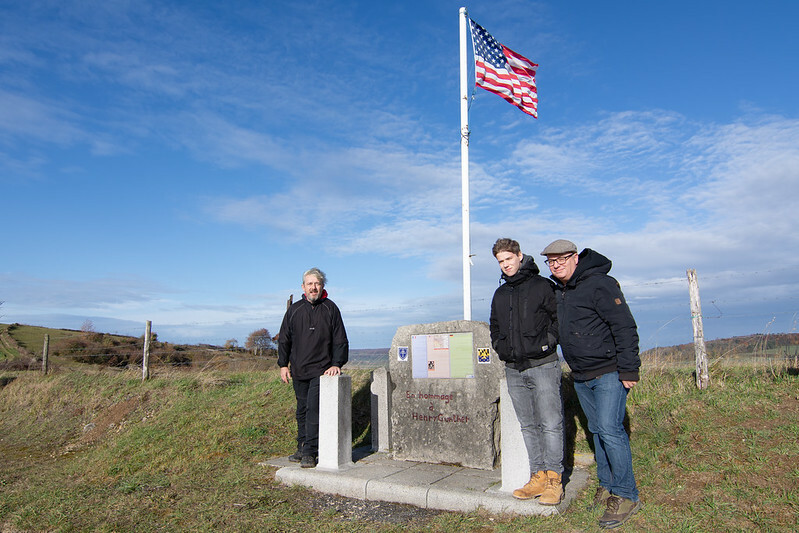 Now four years later I found myself standing in a muddy French field with my son David, at the site where the last of these hapless souls was shot. 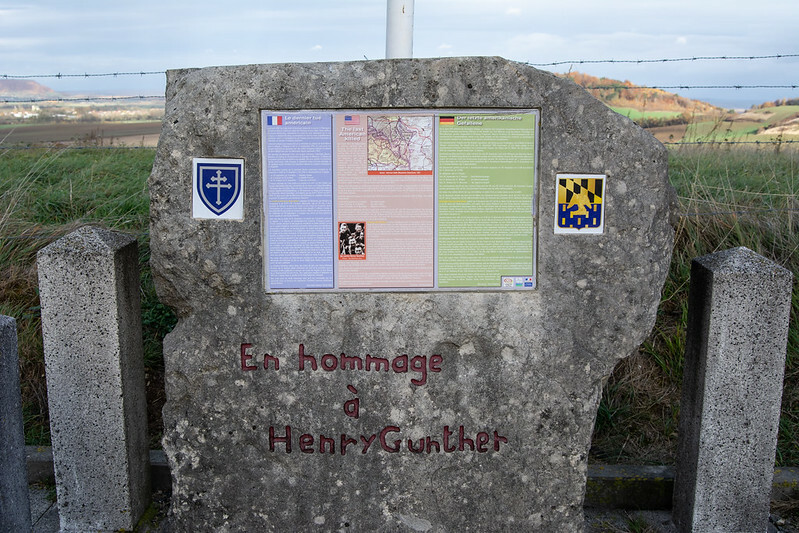 Henry Gunther, a twenty-three-year-old American of German extraction met his maker at 10:59, one measly minute before the cease fire came into force. Fearing crowds and difficulties with parking we had set off bright and early from our overnight stop in Luxembourg. As it turned out there were neither crowds nor parking problems and we arrived in Chaumont-devant-Damvillers with about an hour and a half to spare. The momument is a stiff ten minute walk uphill to the north of the village and at the monument that marks the spot where Gunther fell we met Paul Juckett from Cornwall who had been doing rather more walking than we had. He had started in Paris and had made it here pretty much on foot, visiting many of the western front battlefields and raising money for charity in the process. The armistice itself was agreed at around 5 am in a railway siding in the forest of Compiègne some 60 km north of Paris. In the six hours following the signature the news propagated through the front that fighting would cease at exactly 11:00 – the eleventh hour of the eleventh day of the eleventh month. Gunther was a latecomer to the European battlefields, having arrived in September of 1918. He quickly fell foul of the authorities by writing to a pal back in the USA informing him of the dreadful conditions at the front and urging him to avoid being drafted at all costs. The censor took a dim view of this advice and Gunther was promptly demoted from sergeant to corporal. Something that he resented a great deal. This morning it was very windy but dry and bright in Chaumont. One hundred years ago the weather was damp and very misty. Corporal Gunther and his brothers in arms, presumably fully aware of the impending cease fire, were advancing from Chaumont devant Damvillers (not much more than a church and half a dozen farm houses) with orders to take the German positions on the ridge to the north of the village. Gunther and his friend Sergeant Powell walked out of a fog bank to find themselves confronted with two German machine gun squads. As the Americans approached, their adversaries fired above their heads, Both soldiers hit the ground but ignoring the germans energetic waves and shouts that the war was over. Gunther got to his feet and continued towards the German positions. Finally (presumably muttering the German equivalent of “sod this for a game of soldiers”), one of the machine gunners let off a short burst of fire and propelled Gunther into the history books less than sixty seconds before the guns fell silent all across the western front. 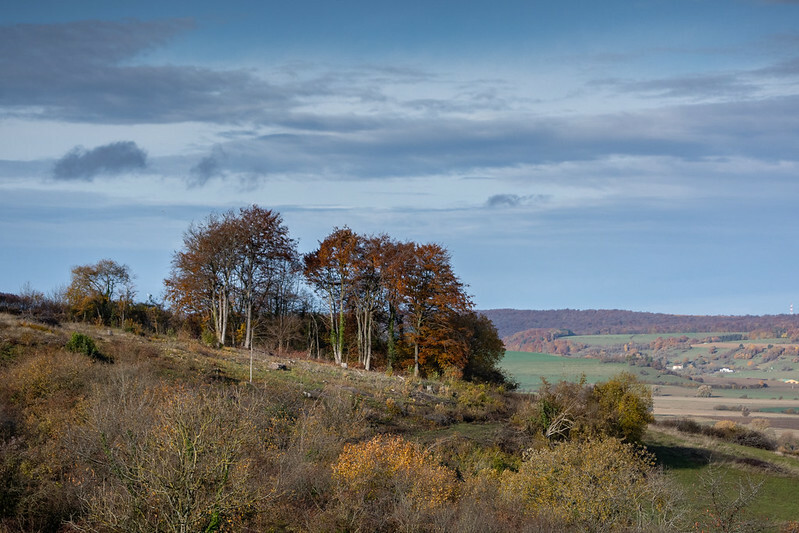 It is hard to imagine what the soldiers who had made it to this point must have been feeling as the armistice took effect 100 years ago. Did they even know that the war was finally over? Did they celebrate with their former adversaries? 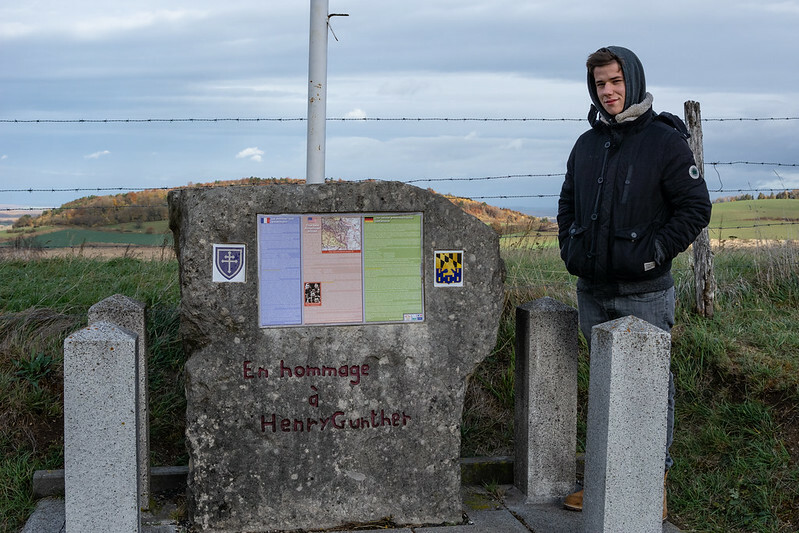 The information board here at Gunther’s memorial mentions “scenes of fraternisation” but I suspect that the atmosphere between the two sides here on the ridge outside Chaumont was frosty to say the least. As the centenary of the armistice approached a few more people joined us. There were several French families and a gentleman who had cycled along the ridge from Mangiennes. We had met him earlier that morning at the German military cemetery. 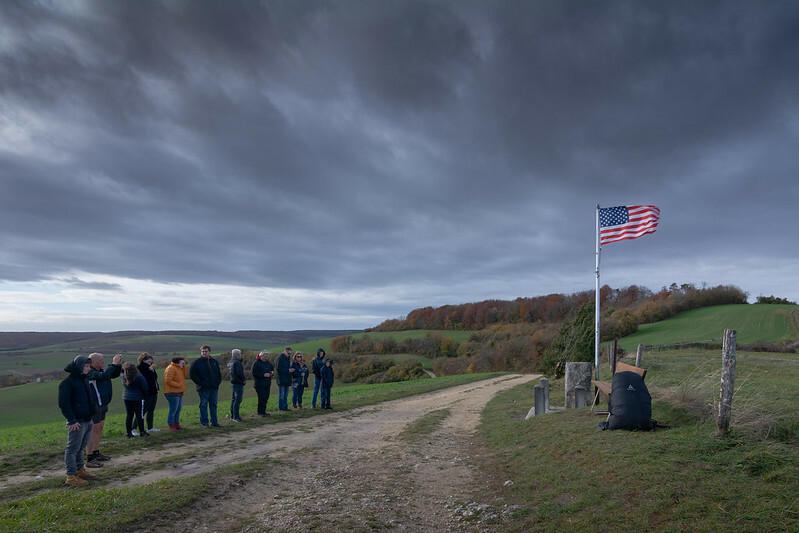 By 10:59 there were thirteen of us all told gathered in front of the small monument that marks the place where Gunther fell. Paul had a wooden cross from the British Legion and a couple of the other visitors brought small bunches of flowers. I wondered whether someone was going to say a few words but no one did. There was no sign of royalty. Prince Charles was hot on my heels at Gallipoli, the Somme & Paschendaele but he hasn’t made it this time.